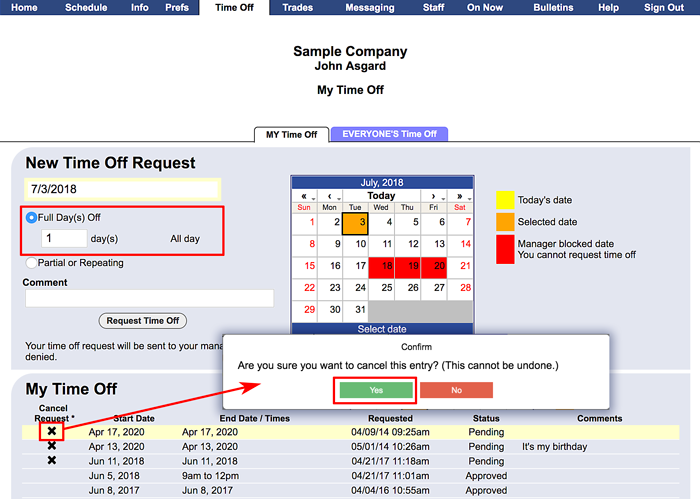 If your manager allows it, you can request time off on a specific date by sending a request to your manager using WhenToWork. You can request a full day (or days) off or part of a day off (and even repeat it over a number of weeks). After your request has been reviewed by your manager, you will notified whether your request was approved or denied. Choose the day you want Time Off from the calendar on the right. 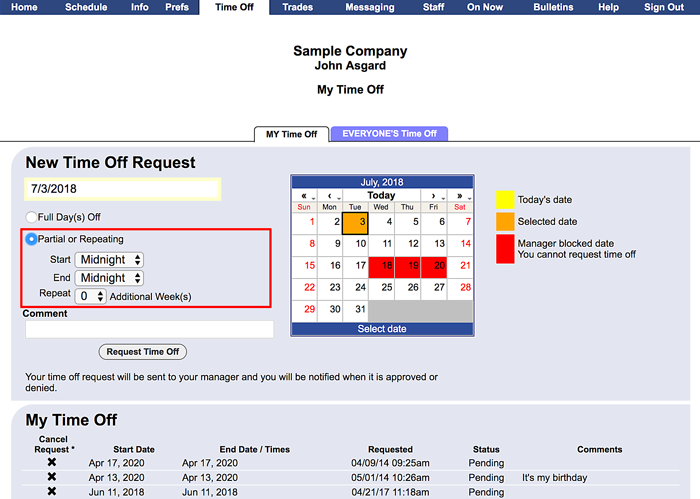 Note your manager may have blocked certain dates so you cannot request them off. If you want to ask for one or more whole days off, be sure the radio button next to Full Day(s) is on. If you want to ask for a number of days off in a row, enter the number of days off. Type in any comment you want your manager to see when they receive this request. Click the Request Time Off button. You will notice the Time Off Request will be showing in the list at the bottom of the page. Your request will be sent to your manager and you will receive a message about their decision. 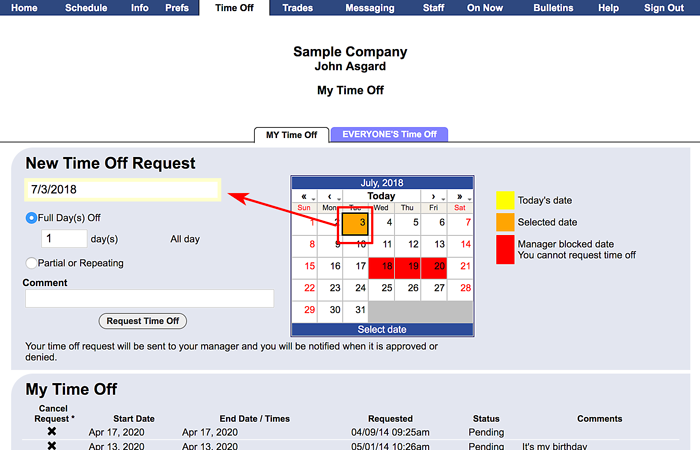 If you change your mind about the request before your manager has made a decision, you can click the Cancel Request link on your Time Off page to remove it. Some managers let you add your own time off and do not require manager approval. If you want to ask for part of a day off, be sure to click the radio button next to Partial or Repeating. Choose the start time and the end time for the time off. If this time off is for a time that repeats over a number of weeks or if you would like to request this same time off for more than one week in a row, enter the number of weeks to repeat. (Ex. if you have a class that is 12 weeks long, enter Repeat for 12 weeks). Type in any comment you want your manager to see when they receive this request. You will notice the Time Off Request will be showing in the list at the bottom of the page. Your request will be sent to your manager and you will receive a message about their decision. If you change your mind about the request before you manager has made a decision, you can click the "Cancel" link to remove it.